At the end of last year YouTube revamped its analytics dashboard for users who upload videos on the website. 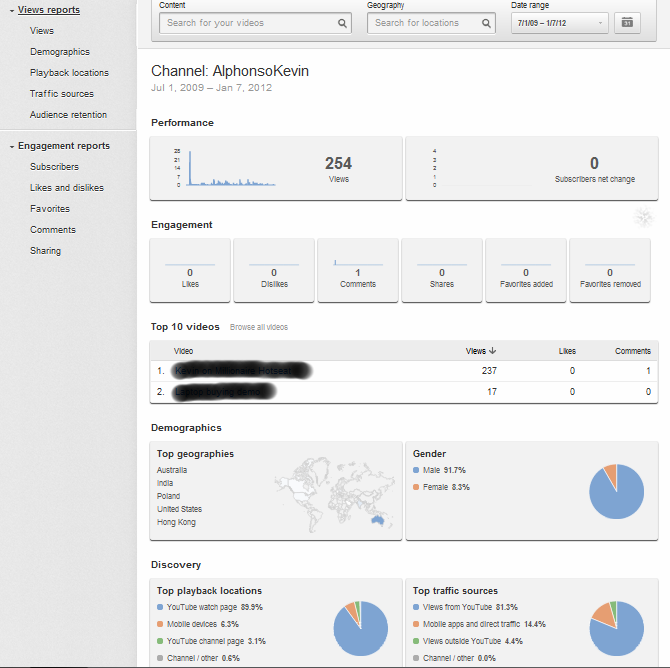 YouTube Insights is now YouTube Analytics, though the previous interface can be accessed for a limited time. This is a screenshot of the Overview report from my YouTube channel. I’m pleased there is a separate section for Engagement Reports, which shows data on subscribers, likes, sharing stats etc. With YouTube now focused on ‘channels’ since the redesign last December channel owners will be keen to follow subscriber counts the way Facebook admins put a premium on acquiring high fan counts. Within the Views Report, Traffic sources and Playback locations (formerly under Discovery) are now separate sections. If you use Adwords Promoted Videos and True View advertising to promote your channel, the Traffic sources report will tell you what proportion of views come from paid advertising. A new section I noticed is Audience Retention which indicates retention level for every moment of the video. This is useful for video content creators to understand how video drop-off levels are affected by content at specific points of an uploaded video or by duration of the video. With better insights on how viewers discover, engage and share video content online marketers can now make more data driven conclusions on what’s working in online video.